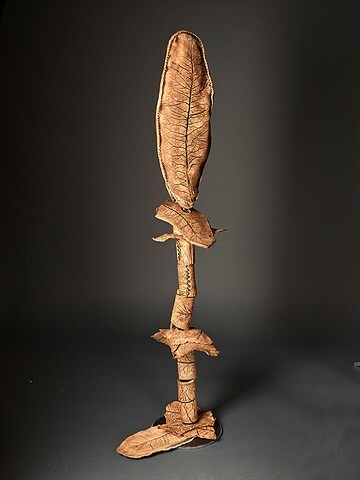 Example of a series of stacked pieces created by capturing the image of the horseradish leaf on slabs of clay. The pieces were fired then stained with black, partly rinsed off, to reveal the creases of the leaf pattern. They were fired again in the gas kiln to pick up a toasty look from the oxidation in the kiln. The final design of the sculpture was determined and threaded on a metal stem which was welded to a steel base.